Laid back resorts, golden sands stretching for miles and sea so clear you can see the loggerhead turtles swimming below – holidays to Zante (Zakynthos) are made for relaxation! This stunning Greekgem is the most southerly of the Ionian Islands with a warm climate that sees temperatures rise above 30 degrees in July and August. The coastal resort of Agios Sostis (Aghios Sostis) might only be small but it oozes Greek charm, whilst Tsilivi combines an easy going vibe, with a resort centre that comes to life at night. A firm family favourite, this Mediterranean delight has something for everyone. 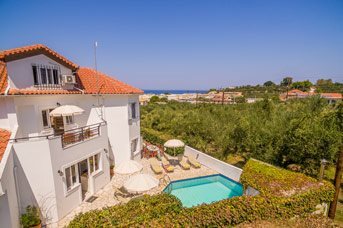 A villa in Zante makes the perfect base for a relaxing holiday, with the freedom to do exactly what you want. Whether you fancy lazy days by your private pool, or prefer venturing out to explore what this wonderful island has to offer, you have the best of both worlds. With a self-catering villa holiday, you can cook up tasty treats on your very own BBQ or venture in resort to see sample the local cuisine – the choice is yours. Zante – also known as Zakynthos – is the third largest of the Ionian Islands, located off the South West Coast of mainland Greece, in the Ionian Sea. The coastline stretches for over 75 miles with a dramatic landscape, rolling hills, as well as olive groves and lemon trees wherever you look. Car hire is recommended for exploring and to capture that all important snapshot of Navagio Beach of course - the iconic shipwreck is one of the things Zante is most famous for. 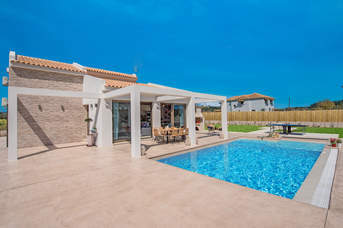 Stay with Villa Plus in Zante between May and October, and enjoy a warm climate throughout. Long sunny days in July and August often see temperatures reaching above 30°C. Or, if you’d prefer something a little more on the mild side, visit the island in the balmy shoulder months and still see temperatures in the mid-20s. Laid back Zante is more about beachside dining and cocktails at sunset, than neon-lit strips. Tsilivi comes to life at night with an array of bars and restaurants offering something to suit all tastes. Or there’s Zante Town, where you can enjoy a sophisticated night out in and around Solomas Square. For any real party-goers, Laganas is close enough for a night out but far enough away, never to be disturbed. The choice is yours! Over the years, Zante has fallen under many foreign occupations, most notably the Venetians, from 1497 – 1797, having the biggest influence in the architecture you will see in Zante Town today. The earthquake in 1953 destroyed much of the town but has since been restored in a way that retains its original charm. Zante Town is the cultural hub of the island with museums, churches and castles dotted around this attractive seaside town. A large festival takes place in the town on 24th August, in memory of Agios Dionysos, the Patron Saint of Zante – the large street procession has a wonderful atmosphere and is not to be missed. Life in Zante centres around its crystal-clear waters, which are simply irresistible. There are lots of boat trips available, whether you fancy swimming in the turquoise blue caves, catching a glimpse of the endangered loggerhead turtles or paying a visit to the famous shipwreck at Navagio Beach. There’s also plenty to keep the kids entertained, including waterparks, fun parks and mini golf whilst culture vultures will love wandering the streets of Zante Town. Like everywhere in Greece, Zante is the ultimate foodie’s paradise. Local specialities include Souvlaki, Moussaka, Kleftiko, Gyros and Baklava with honey. But don’t worry, if you’re not feeling adventurous, there’s an array of international options too, catering for all tastes. With a sandy coastline stretching for miles and shallow crystal-clear waters, Zante makes the perfect beach getaway for families. Tsilivi is particularly geared towards kids and has a variety of things to do. Take a splash at the resort’s very own water park, tee up at the fantasy mini golf or race a mini go-kart of the Luna fun park – the choice is yours. Children will love taking a boat in search of the beautiful loggerhead turtles or sailing to the famous shipwreck at Navagio Beach. There’ll be plenty of free time to jump of the back of the boat for a swim too! 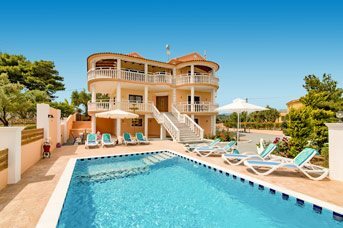 Here at Villa Plus, our customers are always at the forefront of our minds and we believe that our handpicked self-catering villas, in Zante, give you a choice that you’ll struggle to resist. Whether you fancy a spot of luxury in a peaceful countryside retreat, spectacular sea views at sunset, or a central location that means you can walk to restaurants and the beach, we have everything covered. The island has some spectacular scenery on offer so we recommend hiring a car, even if it’s just for a day or two. You can drive the coastal roads, explore some of the hidden gems and be sure to capture that iconic picture shipwreck at Navagio Beach from the viewpoint in the north. As locals to the destination, we’re on hand 24-7 to ensure you have that perfect getaway that you’ve been dreaming of. We live and breathe the destination and want to ensure you leave Zante loving it just as much as we do. If you’re looking for a taste of real Greece, Agios Sostis (Aghios Sostis) is a great choice. There’s a small sandy beach with traditional tavernas lining the waterfront and views across the crystal clear waters to Turtle Island – stunning! This dinky resort is perfect for a relaxing holiday with livelier options within a short drive, including Zante Town and Kalamaki. Set on Zante’s East coast, Argasi is a beautiful seaside village in the foothills of mount Skopos and just 3 miles from Zante Town. The main road running through the resort is flanked by a wide variety of shops and restaurants plus, a lively selection of bars and tavernas. A fine sandy beach stretches alongside the resort too. Laganas, located on Zante's South Eouth coast, is famed for its vibrant nightlife. The lively Strip is the central hub of this popular resort. Lined with bars, shops and restaurants, you'll never be short of entertainment. During the daytime, relax at the long, sandy beach that spans the resort. Located on the North East Coast of the island, just 5 miles from Zante (Zakynthos) Town, Tsilivi has expanded over recent years to become a popular family resort. There’s plenty going on with a great choice of shops, bars and restaurants, a beautiful sandy beach as well as its very own waterpark. And whilst it’s grown in size, it still retains its Greek charm and is a great choice for couples and families alike. The South West peninsular of Zante is home to Keri. This stunning peninsula is split into two distinct areas known as Limni Keri and Keri Village, each with their own unique offering. The picturesque harbour and beach at Limni Keri is a great spot for lunch and the place to go for boat hire. Keri is also the most popular setting for spotting the protected loggerhead turtles. Keri Village is a traditional yet friendly place, home to one of the best places on the island to admire the sunset. Zante (Zakynthos) is said to have one of the best coastlines in the Mediterranean so it’s no surprise that life here centres around sun, sea and sand here! Natural geological formations, have led to the creation of many caves along the coast of Zante. Some can be explored by boat and others by swimming alone. The reflection of the sun on the turquoise waters, within these magical caverns, gives the caves their name. A wonderful experience not to be missed. Many of the boat excursions include a stop-off at Marathonisi Island, which is not only a popular nesting spot for the Caretta caretta turtles but it’s also shaped like one too! For that reason, it’s more commonly known as Turtle Island. Facilities-wise, there’s little more than floating tuck shops serving drinks, ice creams and snacks. But that’s the beauty of it - you can just sit back, relax and take in that fresh sea air. The stunning Navagio Beach and shipwreck is undoubtedly the icon of Zante. The only way of setting foot on its shores is by boat, but can also capture the picture-perfect shot from a viewpoint in the north of the island. Zante is home to the Caretta caretta loggerhead turtle, an endangered and protected species who nest on the beaches here. There are many boat excursions on offer to catch a glimpse of these beautiful sea creatures, in their natural environment. Your best chance is in July and August. This vibrant coastal town is the capital of Zante, with a strong Venetian influence that comes to life at night. Combining top notch history, culture, shopping and dining, it’s definitely worth the trip out. By day, wander the cobbled streets up to the Venetian castle or enjoy a Greek Meze along the waterfront. And by night, venture to one of the many bars and restaurants in town itself or head to Bochali Hill and enjoy a drink overlooking the twinkling lights of the town, below. This small, picturesque beach, sits within the beautiful resort of Agios Sostis (Aghios Sostis), on the South West Coast and is perfect for anyone wanting a relaxing day out. The resort itself offers a bucketful of charm plus there’s a small port offering many water-based excursions. And when you’re ready for a bite to eat, there’s a handful of tavernas to choose from, each with the same wonderful view across to Marathonisi (Turtle)Island. Located on the North East Coast, this long stretch of beach serves up sand golden sands, crystal clear waters and views across to the neighbouring island of Kefalonia. There’s a host of hotels, bars and restaurants dotted along the seafront with a wider choice on the parallel road. Many of the bars, offer swimming pools, free to use, by customers. Plus, there’s a great selection of water sports here including pedaloes, windsurfing andbanana boats. It’s a great place to soak up the sun, by day, and watch the sun set, by night. Amoudi Beach sits within a small laid back resort, north of Tsilivi, on the East Coast. There’s a handful of small hotels, a few tavernas, a couple of mini markets and a bakery, lining the seafront. The beach here is absolutely stunning – beautiful turquoise waters meets the soft golden sand. There’s sunbeds belonging to the hotels and tavernas but none on the beach itself. Just north of Tsilivi, this small, sandy beach has sunbeds available for hire. There’s a handful of shops, restaurants on the on the road leading down to the beach as well as well as a couple of tavernas on the beach itself. Located in Tragaki, just north of Tsilivi, this sandy bay has an abundance of trees provide a wonderful green backdrop. Small boats moor up close to the shore plus there’s a taverna as well as sunbeds available for hire. 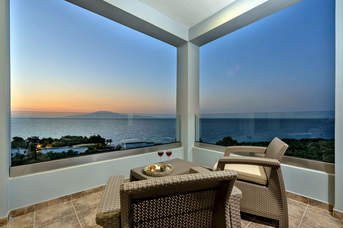 You have views towards both Bouka and Tsilivi Beaches from there. This golden beach stretches for almost 2 miles before merging into the bays of Laganas and Agios Sostis on the South East Coast. As the famous loggerhead turtles lay their eggs here through the summer months, watersports are unavailable, with the exception of pedaloes. Located on the South East Coast, the Bay of Laganas offers one of the best stretches of sand on the island, spanning from the resort of Agios Sostis all the way to Kalamaki. With the exception of pedaloes, you won't find any watersports in this area, to ensure the famous nesting turtles aren't disturbed. Your best chance of seeing one is between July and August. This golden sand beach stretches for over 1 mile and is perfect for families due to its shallow waters. Plus, it retains its Blue Flag status, year after year due to its cleanliness. Sunbeds are restricted to certain sections of the beach, leaving others to just relax on with nothing more than a towel and a good book. There’s a water sports centre for those feeling more active as well as a good choice of beachside tavernas to keep any tummygrumbles at bay! 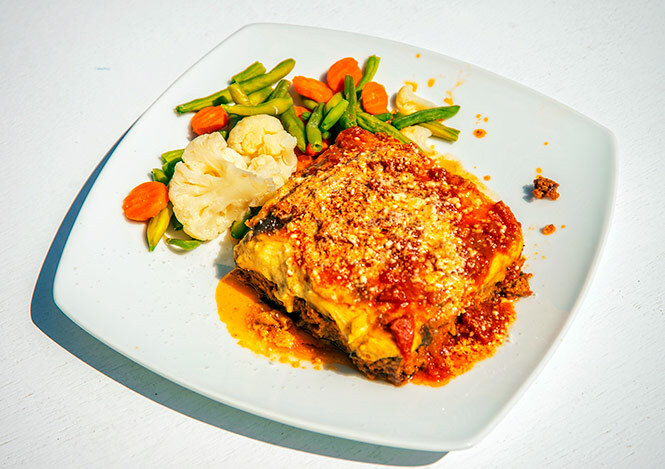 Zakynthians are proud of their Greek heritage and enjoy cooking with local fresh ingredients to cook up some wonderful culinary delights. For the locals, eating out is as much about spending time with friends and family as the food itself and is why meze (sharing) plates are a popular choice. There is a rich variety of traditional cuisine for you to try as well as an array of international options to choose from. Zante (Zakynthos) Town is the place to go for your fresh fruit and vegetables. There’s a local farmer’s market held twice a week on Mondays and Saturdays, in the market square next to the port. And, if you fancy cooking up some fresh fish on your BBQ, head down to the waterfront in Zante Town where you can buy freshly caught fish, straight from the boat. You’ll need to be there early though to get the best catch!. Pitta and Dip – No meal is started without warm pitta bread and a selection of dips, including Tzatziki (mint, garlic and yoghurt) and Taramasalata (cured roe, olive oil and lemon juice). Gyros – A typical Greek snack made up of pork kebab meat, salad, chips and a tzatziki dip, all wrapped in a pitta bread. A great option for lunch or something quick on the go. Souvlaki – Skewers of meat – either lamb, pork or beef – generally served with chips/rice and a garnish of salad. A simple dish that makes a greater lighter option for mealtimes. Lamb Kleftiko – this rustic Greek dish serves up lamb at its best, slow cooked in parchment paper with tomatoes, potatoes, aromatic herbs and cheese. It’s served piping hot to your table and is absolutely delicious! 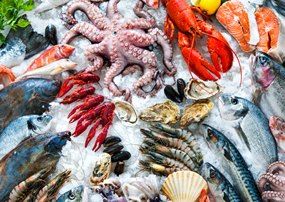 Seafood – The freshly caught seafood here is not to be missed. Meze-style options include calamari, grilled octopus, garlic king prawns and fried white bait – a great way to sample of variety of the seafood options available. Greek Salad - No meal is complete, without the simple yet iconic Greek Salad consisting of the juiciest tomatoes around, peppers, onions and olives, topped with a slab of feta cheese and seasoned with dried herbs. After preheating the oven to 190 °C, slice the aubergines before frying them on both sides with a little olive oil. Once cooked, put to one side and use the same pan with a little more olive oil to fry off the onions and garlic for approximately five minutes. Turn the heat up and add the lamb to brown it, followed by the tomatoes. Add a good pinch of cumin and cinnamon with the wine and sauté together to break up the tomatoes. And finally, gradually add the chopped mint. In an ovenproof dish, layer the aubergines and lamb mince a few tunes, finishing with a layer of aubergines. Combine the white sauce with the eggs, nutmeg and seasoning. Spoon over the top of the mince and then scatter with the grated cheese. Bake in the oven 20-25minutes to colour the cheese and cook through.